The Magpie's Nest...: Jenny HIll wins a contest and earns a new title, arnie's chicks come home to roost, and 'plankers' ... rhymes with? Jenny HIll wins a contest and earns a new title, arnie's chicks come home to roost, and 'plankers' ... rhymes with? Also, one boozer laughing all the way to the bank, and Hinchinbrook MP Andrew Cripps has a 'deliverance' moment. So, this week, let's skip the sublime and go from the ridiculous to the ridiculous. It is with fascination that we have reflected on the trajectory of Big Arnie, the Austrian bodybuilder whom Clive James so memorably dubbed as looking like a condom full of walnuts. After flexing his way through Conan the Barbarian, he then became the Terminator, then the Governator (of California), and now it turns out, he is the Impregnator. And eventually, the Germinator. Yup, it seems Arnie has been bench pressing the hired help in the linen closet while the missus was out at Bi-Lo. And it also seems that unlike his movies, Mr Schwarzenegger 'laid an egg', resulting in James Thurber's famous phrase, 'their union was blessed with issue'. Mrs Arnie isn't sharing the blessing - literally or metaphorically - and isn't being much of a sport about her hubby's excuses ( Aww, c'mon, Maria, I vas just verking out, doing der press-ups, and she fell underneass me'). It appears Ms Shriver has taken the decided view on the evidence that he wasn't working out so much as, well, working in. She hasn't taken it too well. Indeed, it was such a shock, it is said she became the regurgitator before terminating the terminator. The meltdown is complete, and this time, he won't 'be buck'. Well, not to the marital Posturepedic, anyway. But Mr S is heading back to the movies, and, golly, talk about art imitating life; the new flick is titled - this is fair dinkum - Cry Macho. That should be a hit with the sisterhood. And the divorce judge. It was also the week when we learnt that Plankers are, as the Poms would have it, plonkers. Or in one unfortunate case, kerplunkers. But in the broader view, it just seems the latest way of cleaning out the shallow end of the gene pool, a la the Darwin Awards. Magpie mate Jim A. offered the most succinct summation of this latest bit of kiddy nitwittery. 'Plankers - rhymes with ....? But the Magpie is wondering about all the fascination with what some seem to think is a new phenomenon. Over the years, The Magpie has often indulged in planking as he wended his weaving way home from the Poseurs' Bar. Of course, this only ever happened when the old bird was, shall we say a tad 'tired and emotional'. As a newt. The new(ish) trend that did catch The Magpie eye goes by the name 'yarn bombing', or as the insolent whippersnappers call it, grandma graffiti. It is basically knitting or crocheting colorful coverings for all sorts of public statues, objects and even cars. A craze that is gathering momentum in - where else? - America and now in Europe and Asia, it is far more painstaking, skillful and artistic that your run-of-the-mill spray can 'Yo Klutz, Da mon, yeah, roight' type of kiddy vandalism. Worth a look at how the New York Times viewed the phenomenon. The `Pie must confess he zoomed in on the story when he mistook the term 'yarn bombing' to be another critique on The Daily Astonisher's editorial style, but happily, it wasn't. However, it was politicians on the local scene that caught The Magpie's gimlet ear in recent days. And here in the `Ville, the title of Moody Matron of Negativity Contest 2011 was up for grabs. This is not so much a 'beauty' contest as more a 'beat-up' contest. The perennial favourite and previous serial winner Jenny 'The Talking Mullet' Hill got a nasty surprise when Lindy 'FIFO' (Fly-In-Fly-Out) Nelson-Carr issued a serious title for the crown. After all, it was Clr Hill who prompted the recycled joke 'What's the difference between Jenny Hill returning from an out-of-town trip and the 737 she flies in on? Answer: At least the aircraft stops whining when it has landed. Here are the two entries for the title. First, FIFO. She decided to take Townsville's deputy do-dah Kid Crisafulli to task over his very legitimate criticism of the State Government for bulldozing over the top of local government planning rules. The Blight government has ruled, by fiat, to plonk down sore-thumb 'social housing' units in a central Aikenvale location that has the potential to radiate disruption across an entire and hitherto attractive neighbourhood. This sort of move is social engineering at its worst with more than a whiff of the 'politics of envy' about it. Just ask the simmering residents of the quiet, friendly backstreet Bishop Street at Belgian Gardens, what happens when the Housing Commission buys a six or seven bedroom house and installs an unruly mob of whinging black racists who have disrupted the whole street for more than two years now with with foul-mouthed, racially tinged threats and abuse, drunken fights and wheely donuts in the street at all hours, and a perpetual late night police presence. And that's not racist, those are facts. It is also not to say that that would be the outcome in Aikenvale, but since we're into the brutal truth just now, let's face it, many of the disadvantaged (of all races) have a chip on their shoulder, which is so often perpetuated by dysfunctional family life fueled by alcohol and drug abuse. Often, their attitude is manifested in general disregard for the rights or amenity of others. Certainly these problems need to be addressed, and inevitably, the taxpayer should willingly foot the bill for the overall good of the community. But this sort of social engineering in the housing sector isn't the way to do it, and is counter-productive. None of the above was even hinted at in The Kid's criticism of the Blight government's tactics, but suddenly up jumps FIFO, accusing him of NIMBY (if you've forgotten, Not In My Back Yard) politics. Ever one for a laugh, Lindy challenged The Kid to name his preferred location. (He should've replied 'next to your house'). Lindy deadpanned her opinion that this was about people and not the development itself, which will not be built within a country mile of her Townsville 'holiday' home. Damn right it is about people, particularly those ratepayers and taxpayers whose hard-won lifestyle will be affected by this government disregard. But The `Pie nominated FIFO for the Moody Matron of Negativity award because he found it more than a bit rich for a perpetually ineffective, cozily monied-up retiring MP to wade into this issue, when for much of her tenure, she lived in Brisbane with her union activist hubby Russ. Unless it was to parrot the party line on the occasional feel-good government announcement, we hardly heard a dickybird up here about local issues, even when she popped back for family reasons. Now all of a sudden, the lame duck is quacking in her home pond, with an eye to the coming state election. Well, sterling effort and good try, FIFO, but you were up against the local version of what former US VP Spiro Agnew termed 'the nattering nabob of negativism' in The Talking Mullet. Our Jenny wasn't about to let such a lightweight take her title, and her defense of her crown was textbook. She has retained her title with her carefully crafted entry incorporating inadvertent humour, thought-disordered reasoning and, in sporting parlance, a superb own goal. This title-winning performance can be seen here, as The Mullet fumbles her way through a thicket of gabbling bulldust in yet another counter-productive effort to have another go at the current council. But all she simply manages to do is skewer both His Radiance's previous regime ... and by inference, herself. Briefly, the scenario is that Townsville Council discovered for some two decades it had retained monies from people submitting development applications, to the tune of more than a million bucks, money which should have long been returned. Bit of a bureaucrattic bungle - which had been going on for more than 20 years. The Mullet seized on this, berating the current council for making interest on money not rightfully theirs, and ripping off the ratepayers. Hello, anyone home, me old mullet? 20 years give you a clue? That would be at least 17 of which His Radiance was playing mayoral footsie with his chosen inner coterie of developers - nothing illegal but sometimes with the appearance of being too cosy and convenient for comfort. And this would be a period when you yourself, Jenny, picked up handsome bonuses for heading committees which would be involved and informed of such monies. KAPOW!! nice shot, darlin', there goes the the ball straight into the back of your own net. Look there's a lot of current councillors who should not get in next time, but this sort of childish pap is creating a wave of ill-deserved sympathy for the wrong people. So The Magpie has taken the rare step of altering an established moniker for one of his regular cast of characters. 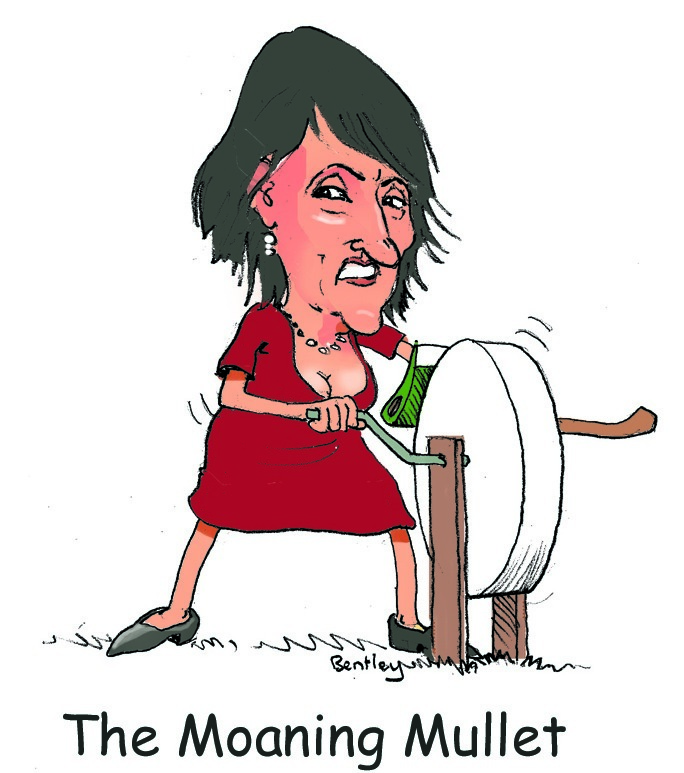 Henceforth, as Bentley's succinct portrait illustrates, Jenny, you are no longer The Talking Mullet. 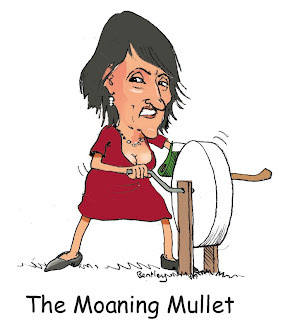 Your now officially The Moaning Mullet. Finally, back to the international sporting scene, and one Carlos Boozer. Making merry with people's names is often poor sport, but given The Magpie's own ridiculous real life moniker, he feels he is licensed to make fun in this area. Indeed, in this era of role modeling and prescriptive clean living, it is strange to note that Mr Boozer is a nationally acclaimed American basket baller with the Chicago Bulls, and not surprisingly tends to cop much yuk-yukery flak when his performance is not up to scratch. But why should he care what the fans, or The Magpie says? He gets the last laugh all the way to the bank ... our man gets paid $13million a year. The Magpie does not. It is now away to Poseurs' Bar, where perchance the old bird will manage to inveigle some comely young thing into trying The `Pie's own advance on that new craze. He calls it face to face full frontal double planking. Experience however suggests The `Pie will end up stiff on his own again. Bahahaha Isn't it very funny when the ALP members try to take a swipe at the current council and gets it totally wrong... What do you think maybe happened in her head as that went on? Did she really think about it or did she react to what may have been a good idea at the time... well while it seemed like a good idea, at the time, I was probably not the time to be making such a large stuff up within a year until the next election. Needless to say we all know she will not get in but the Townsville Bulletin will do its best to support her in any endever she decides to take.... I bet that stuff up will not even come close to being print on chip wrap.... Not with the current under the helm. Great edition this week Magpie ! Totally great !!!! !